Our popular Fringe File series on the Minnesota Fringe Festival returns. Pictured: Max Wojtanowicz in a promotional photo for MN Fringe 2016’s Ball: A Tribute to My Lost Testicle. A Fringe show may begin with the first glimmer of an idea or the drawing of its number, but its first incarnation ends with the money. After the set is packed, the lights are turned off, reviews digested, and the headache from the last-night-of-Fringe party has slipped into a fog of memory, Fringe producers get one more thing in the mail: a check for their box office receipts and a list of how many tickets sold at each performance. The show image for Hit the Lights! Theater Co.’s Dungeon. HtLTC is one of several New York City-based ensembles performing in this year’s Fringe Festival. What do we need to pay for? What do we want to pay for? What do we think we can make back in ticket revenue? 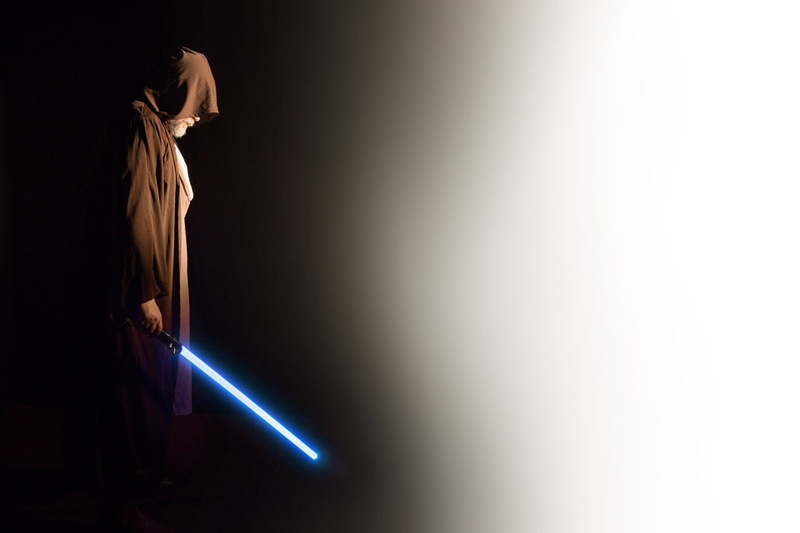 A promotional image for Dave Stagner’s The Tragedy of Obi-Wan Kenobi, a show appearing at the 2017 Minnesota Fringe Festival. boosting the average Fringe Festival show attendance. A few rants against change notwithstanding, the first was a clear, unmitigated success: even at the most popular shows, the wristband system (in which a 1-day admission wristband is shown to receive a show-admission token, which can be quickly collected with no scanning) vastly simplified crowd management. Large lines of token-bearing patrons flowed smoothly into venues; and as evenings progressed, the box office lines were notably shorter even as the queues of wristband bearers swelled. For that reason alone, the wristbands were clearly destined to stay. 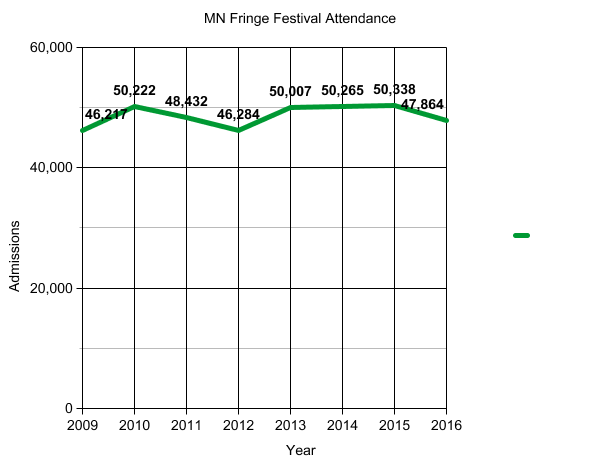 MN Fringe Festival Attendance, 2009-2016. Data source: MN Fringe Festival. The success of the second goal is harder to gauge. 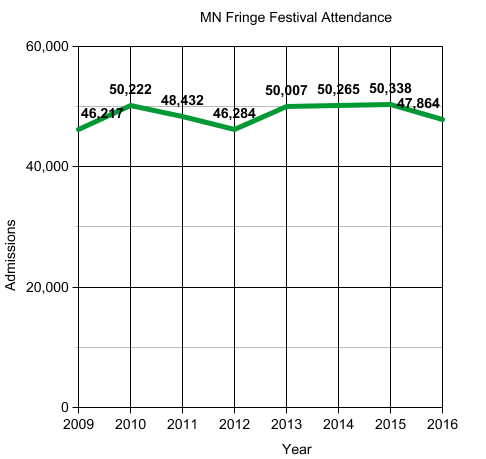 This is partly because of an attendance hit from the Summer Olympics – 2016 MN Fringe attendance dropped about 5% (from 50,338 to 47,864), paralleling a similar drop in 2012. 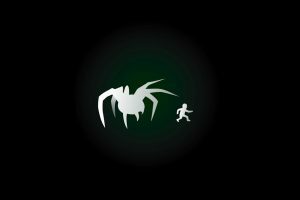 There is also a certain level of abstraction in the available data – short of barcode scanning, RFID tracking, or other measures, it’s not always clear when one person is attending many shows versus more people attending fewer. 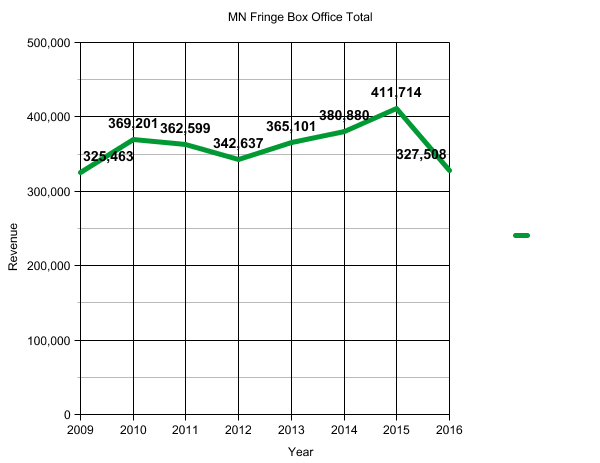 MN Fringe Festival Box Office Totals (USD), 2009-2016. Data source: MN Fringe Festival. That question represents progress. Previous years had the more complex “How many people came to my show, how many of them were comps, and how much do we get paid for the rest?” Under the pre-2016 system, predicting box office revenue from butts in seats was difficult – after all, many of those attendees could be fellow artists, Fringe staff, members of the press, and others using comp tickets…none of whose being there directly contributed to the box office total. Under the new system, all butts in seats for a show are counted…but the exact payoff is calculated based on a show’s butts-in-seats total as a proportion of the festival and venue totals. While producers might answer “How many people came to my show?” through astute counting, the “How much do we get paid?” was still up in the air when the afterparty began. 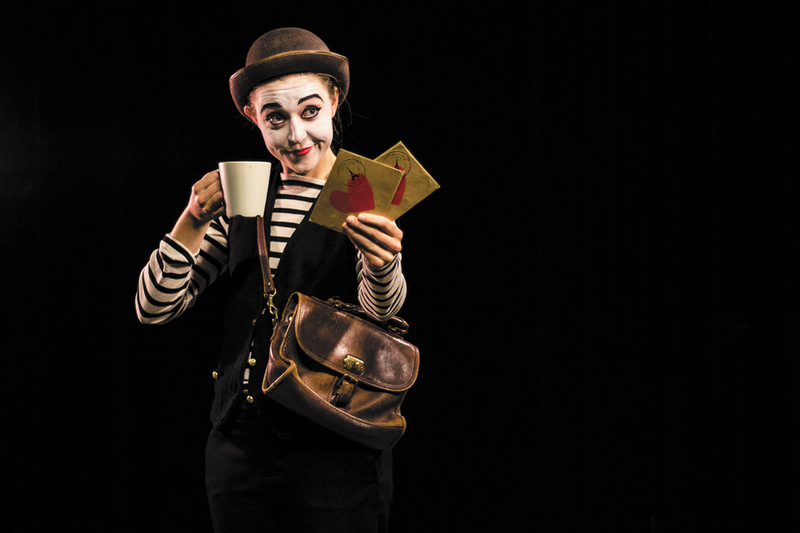 A promotional image for the mime show Lettres et Café, part of the festival’s 2017 lineup. All filled seats are counted towards the payout for each artist. The number of seats filled is multiplied by a dollar figure calculated by the total day’s pass sales, divided by total attendance. From a producer’s perspective, this greatly simplifies one Fringe paranoia from years’ past: a show being popular amongst other Fringe artists, but not with the ticket-buying public. Three producers shared stories of having as few as one out of four seats was filled by a paying customer – an unpleasant surprise come payout. Four of the eight producers also stated that show revenue was a point of significant anxiety, since they were unable to estimate the box office gross mid-run. One thing is for sure: the wristbands are here to stay. As the MN Fringe’s Executive Director Dawn Bentley said at Monday’s preview, they’re coming back.